We entered Zion from the east side. It is hard to describe the view after you emerge from the Mt Carmel tunnel and enter the park. The sight is just spectacular, as you enter the bottom of the narrow valley there are steep cliffs rising thousands of feet into the are surrounding you. It reminds me of entering Yosemite Valley except the Zion valley is much more narrow and the vertical walls show rocks of almost every color you can image with white, pink, orange, red, tans and browns ! The scope and size of the erosional valley is truly breath taking and I when I saw it for the first time I knew I found a photographers heaven ! We had almost perfect weather with lots of puffy white clouds against a blue sky backdrop. 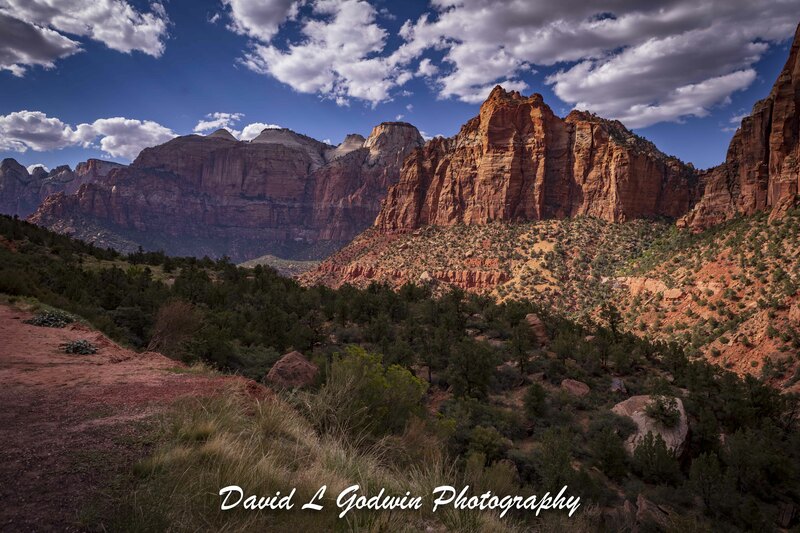 Hope you enjoy this image, I have selected several more photos to share with you from my visit to Zion, including one of my all time favorites. So let me know what you think.